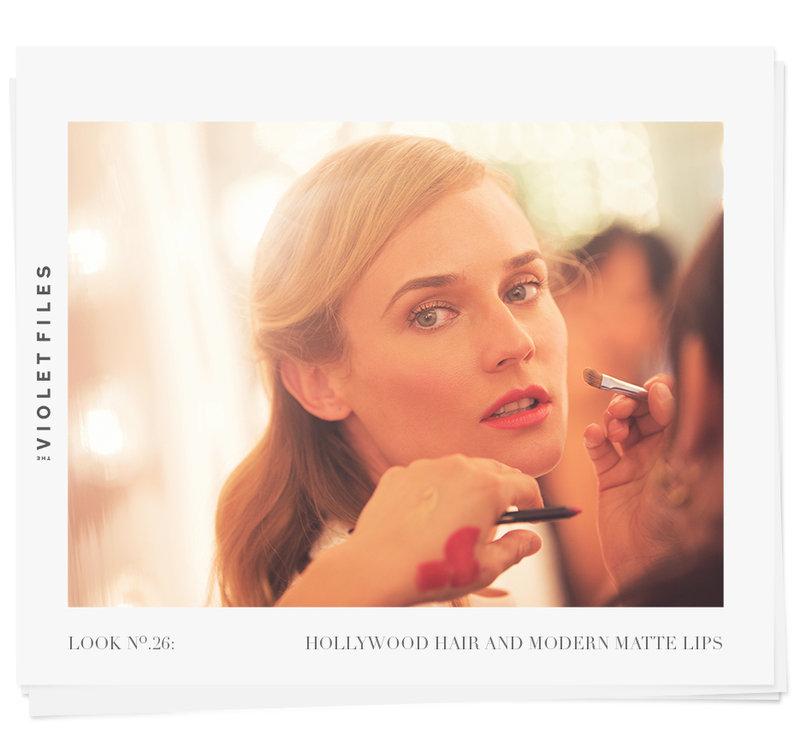 Makeup artist Kara Yoshimoto Bua and hairstylist Marcus Francis walk us through the creation of Diane Kruger’s Hollywood glamour waves and modern matte lips. Channeling the classic Hollywood icons of yore, Diane Kruger cavorted around the backlot of Paramount Studios for her Violet Files cover story, playing a character that hews closely to her real self—a perfectly put-together actress flouncing around set between takes. To update the silver-screen starlet look for the present day, hairstylist Marcus Francis gave Kruger a polished wave, casually twisted into a half-up style, while makeup artist Kara Yoshimoto Bua added a fresh, modern matte lip in a punchy, crimson-tinged coral. Below, the two break down the process of perfecting the actress-off-duty look, so even if you’re not a screen siren cruising the lot, you can at least look like one. Kruger arrived on set with clean, dry tresses, so Francis used a little Suave Volumizing Weightless Blow Dry Spray on the roots to give lift and flexibility, then dampened the ends and added Suave Soufflé Mousse before blowing hair dry. Kruger loves a side part, so Francis gave her a deep one. He then used a one-inch barrel curling iron to create waves, wrapping the hair from roots to ends. “It was more about a fullness than a curl effect,” he says. He let the waves sit, spraying with a touchable hairspray (he likes Suave Flexible Control Finishing Hairspray), which allows for touchups throughout the day. Given the humidity on set that day, Francis was careful to avoid causing Kruger’s naturally wavy hair to frizz up. To prevent such issues, Francis used a comb like this one from Yves Durif. “The wide-toothed comb doesn’t really fluff up the hair cuticle; it just separates the curl into a beautiful soft wave,” he explains. Francis’ original plan was to leave Kruger’s hair down, but the actress wanted more of a ‘look.’ He says, “She really likes things to be memorable, and I love creating those things in a story.” Francis pulled Kruger’s hair partly up, keeping the swoop of her side part in front and giving it a little twist for an au courant pin-up feel. He then secured the actress’s locks with a crisscross of bobby pins for an effortless yet considered effect. To even out Kruger’s skin tone, Yoshimoto Bua began with this lightweight foundation, blended on the back of her hand before she applied with a makeup brush. “I like to do a wash of foundation first,” she says. “Then I’ll do spot coverage, so it stays light—I don’t like to cover the entire face with foundation.” To highlight and conceal, Yoshimoto Bua used two shades of Chanel’s Éclat Lumière Highlighter Face Pen, the lighter shade for brightening and the darker for covering up. “The trick with using a powder to contour is that when you put the product on the brush, you want to really shake it around and pat the brush back and forth in the compact or on your hand—so that you’re evenly applying the product onto the brush—before you apply it to your face.” Yoshimoto Bua then brushed the product with a sweeping motion below Kruger’s cheekbones (in line with the tip of her nose to the top of her ear), under the jawline, and on the sides of the forehead. Next, she tapped the apples of the cheeks with Chanel’s powder blush, in coral-toned Angelique. Yoshimoto Bua wanted to give Kruger’s lids a soft smokiness to bring out her striking blue-green eyes. She began by washing a golden brown color across the lower and upper lids, and highlighting the brow bone with the lightest shade in the compact. Next, she lined the top lid with Chanel’s waterproof eyeliner in Espresso and coated lashes—a few times—with Le Volume de Chanel Mascara. On set and up close with the multilingual actress and Chanel ambassador.